Providing and installing 3 nos. of Rope pumps in two villages covering 125 households and 3 nos. of Rope Pumps in Govt. Primary Schools in the Sethubavachatram block of Tanjore District, Tamilnadu for drinking water. In Vellivayal village all the 75 households get the drinking water only from this Rope Pump and hence they take intensive care in the maintenance of the Rope Pump. The repairs are attended to the and there by the people itself. 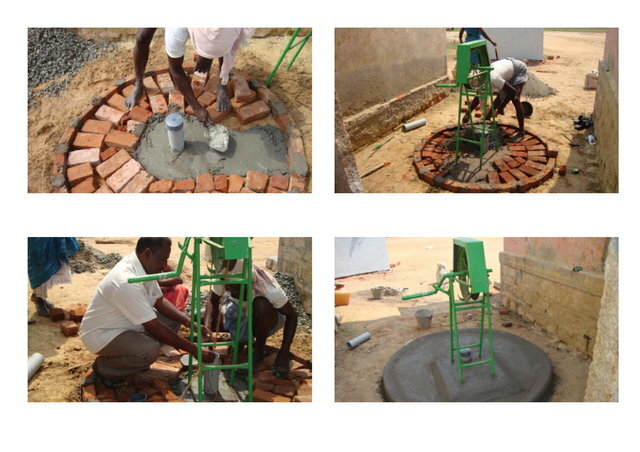 In the Mallipatinam village theft of the Rope Pump (or parts) is a major problem. Though necessary safe guard measures were taken, so far, the rope pump parts have been replaced thrice in this village.